A more sneaky way to get mount from cross sides if the opponent blocks or catches your leg when you try to hook it over. 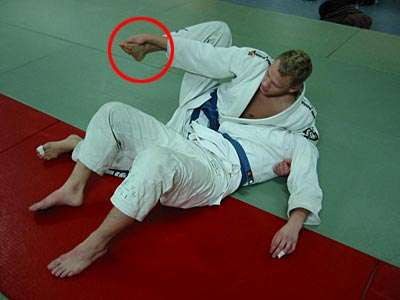 Ok I am in the position ready to mount my opponent, but I know he is aware of my trying to hook my leg over and he is ready to block or catch my leg into his halfguard. I now grab my right foot at the ancle with my right hand. I use my hand to pull the foot thight to myself and slide it across his stomach just above his helt. Pull my weight over and mount.